Winter (or whatever you have) Clothes Drive for J.O.I.N.! Come and bring your clothes that you do not wear anymore and consider donating them to J.O.I.N. an organization that coordinates with other downtown churches to help clothe and feed the poor and homeless. We are collecting clothes this weekend, Saturday November 3 and Sunday November 4 at all the masses! If you would still like to donate and could not bring it to the Cathedral this weekend, please e-mail the group at yagroup.stjosephcathedral@gmail.com to make arrangements to collect them at a mass during the weekend. Thank you! Today's Gospel talks about the greatest commandment of all - Love God with all your heart, mind and soul. Love your neighbor as yourself. Jesus himself said these two are the sum of all the 613 Jewish laws mentioned in the Torah. It is impossible to love another without loving God and it is equally impossible loving God without loving our neighbor or ourselves. For love to exist, God is present. For love to exist, our whole heart, mind and soul should love the other person. Love is not just a quick or sudden feeling, it is built over time and over many sacrifices that one has to give up in order to offer love. True love is what God has to offer us. For us to share that true love, we need to have God in our midst first and foremost. It is only then we can say that we have shared our love for our neighbor and ourselves. Let us share this love to others by sharing what we have that they may truly feel loved as well. More details upcoming and more events cooking for our upcoming anniversary month! Triple V group, I received Fr. Mike's blessings to do two things for our Anniversary Month! We are going to advertise that we are collecting clothes for the poor and needy that we will be sending off to J.O.I.N. It is an arm of the Catholic Diocese in helping out the poor. Start going through your closets or start your fall cleaning of your closets! We want to make our anniversary celebration this year, the year that we are visible throughout the city. On First Friday, November 2, 2012 @ Holy Cross Parish, we will have our 3rd Year Anniversary Mass at 7:30 PM. The mass is followed by the Eucharistic Process and Eucharistic Adoration with the reception of the Sacrament Reconciliation (till all are heard). Announcement: If you have a family member or friend that died this year and would like the group to pray for this coming First Friday/Anniversary Mass, please e-mail me through the group's website and we shall have a listing of all the people to pray for this month! During the weekend of Saturday/Sunday, November 3 and 4, we have collected so far about 8 bags of clothing for J.O.I.N. We are still waiting for other people that might be interested in donating clothes before taking them to J.O.I.N. So, if you have clothes that you would like to give to the poor and homeless, let us know about it and we shall include it in the bags of clothes that we have on storage to donate! On Sunday, November 18, if we can all attend the 5:15 PM mass, then do Vespers and then go out and have dinner at a Tip Top Kitchen and Cocktails restaurant where we can share stories amongst each other after the mass. It is located at 73 E. Gay Street, 43215 which is a couple of blocks away from the Cathedral parking lot off Gay Street. Check out their menu for an idea of the price and of the food they serve. This is a celebration, so we shall all do that! Be responsible as well too! See you all on Sunday! Need directions - click here! Today the Church celebrates the feast of the Dedication of the Lateran Basilica in Rome, the Mother Church of Catholicism. The Basilica of St. John Lateran is the cathedral of Rome. This is not St. Peter's, but it is the Pope's cathedral. Also called the Church of Holy Savior or the Church of St. John Baptist, it was the baptism church of ancient Rome. It was built in the time of Constantine and was consecrated by Pope Sylvester in 324. This feast became a universal celebration in honor of the basilica called "the mother and mistress of all churches of Rome and the world" (omnium urbis et orbis ecclesiarum mater et caput) as a sign of love for and union with the See of Peter. The foundation of the Lateran Basilica goes back to the time of Constantine, the time of the last persecutions. The palace of the Laterani, on the Coelian Hill, belonged then to Constantine's wife Fausta. After his conversion, the Emperor gave it to the Pope as his private residence and founded in it the church of the Lateran. It was dedicated to Christ our Saviour by Pope St. Silvester on November 9, 324. In the twelfth century, it was given as its second title St. John the Baptist whose name was also that of the ancient baptistery connected with the church; hence the present name of the basilica, St. John Lateran. The first basilica having been destroyed, it was rebuilt in the tenth century by Sergius III and consecrated by Benedict XIII in 1726. 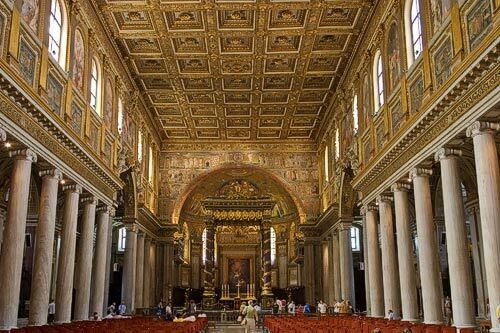 In the basilica and palace of the Lateran were held the Roman councils at which many were present at certain periods; five great ecumenical councils have also been held there. On the most solemn days of the liturgical year the station was at St. John Lateran. There sacred orders were conferred as well as the Easter baptisms. The residence of the Popes were there and the whole rhythm of Christian life made it the very center of Christianity for a long time. Today's reading, though it is already evening, can be seen by clicking here. First Friday TODAY, November 2, 2012 - ALL SOUL'S DAY + Triple V 3rd Year Anniversary Mass! On Friday, November 2, 2012, the Triple V Group will attend the 7:30 PM Mass at Holy Cross, received the Sacrament of Reconciliation and stayed for 4 solid hours in vigil during the All Night Vigil. It was an awesome experience and everybody at church was thrilled to see young people doing Eucharistic Adoration on a Friday night! Today marks a special day in the lives of the Triple V Group - it is our Third Year Anniversary as a group AND not only are we praying for vocations this weekend but for all the souls of the people that asked us to pray for them this weekend/month as well! This is the longest Eucharistic Adoration that has been going on in the Diocese of Columbus. Pierre, the leader and song presider last night, is the longest member of this Eucharistic Adoration. He pretty much was there from the humble beginnings of the Eucharistic Adoration in the early 80s. There are so many souls out there that are in dire need of prayers and you can help them out! Do consider spending your First Friday nights in the company of Jesus Christ. It's once a month and it gives you peace. Also, you get a chance to save a few souls here on earth or from purgatory! Would it not feel great to know that you saved a soul? Whether it be yours or some one else's, you are a hero! God loves us all, but we need to shape up and learn to approach Him in the Blessed Sacrament. Born in 1745 at Civitavecchia near Rome, the son of a wealthy businessman, Saint Vincent Strambi never showed any inclination for any occupation other than the service of God. He found his vocation when after his ordination as a deacon in 1767, he made a retreat amid the Passionists of Monte Fogliano, where Saint Paul of the Cross, their founder, was residing at the time. The Passionist houses are called retreats, and by their Rule must be situated outside cities. Saint Paul of the Cross told his brethren on his deathbed, as he had taught them during his active years, to conserve always the spirit of prayer, solitude and poverty; in that way the apostolic success of their works would also be conserved. The life of contemplation, essential formation for any fruitful works, was what Saint Vincent Strambi already desired. It was formally declared by his last secretary, Monsignor Catervo Serrani, that “it would not be temerity to believe that he knew by heart all the works of Saint Thomas Aquinas.” The same might have been said of his knowledge of Sacred Scripture. His studies of religion, ever an inexhaustible wealth, continued throughout his lifetime, yet his preaching was so simple that all could easily grasp his thought. He never used notes, but taught according to the needs of his listeners, which he always discerned with exactitude after praying intently at the foot of the crucifix. As he studied, he seemed to see around his desk the faces of his spiritual children, waiting for “the bread of life” he was destined to break for them. This method of study has been preserved among his followers in the Order; the Passionists think of, and pray for, their future spiritual children before they study. As bishop of Macerata and Tolentino, he continued whenever possible to rise at midnight for the divine office, and regretted being unable to dedicate more than five hours to prayer each day. He called in the poor and gave them alms; he visited the hospitals and the prisoners, blessed, embraced and helped them. He visited every religious house of his diocese, then the Canons and the parish priests. He preached for his clergy a beautiful mission, then organized specialized services for the various professions of the laity, saying, “the lawyers need different instruction and different sowings than the merchants or the physicians, for example; to each his own portion of the truth!” His table was very frugal; never did he permit more than two dishes. He reduced expenditures to a minimum, to be able to give more to the poor. He wished to resign as bishop at the age of seventy-eight, and Pope Leo XII ceded to his wish, but asked him to come to Rome as his counselor. That his life was soon to end was revealed to him, and when the Holy Father was about to die that same year, he offered his life to save that of the Vicar of Christ. He did not say so directly, but told everyone not to be anxious, because the Pope would live. Someone he knew had offered his life for him, he added. The prayer was answered on the very day he said this, December 24th; the Pope rose, suddenly cured. Three days later Saint Vincent was struck by apoplexy, and died on January 1, 1824. He was canonized by Pope Pius XII in 1950. 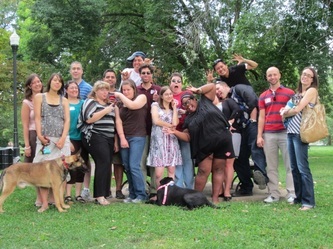 Fellow Triple V members, this month, two of our members in the group are leaving (or already left) Columbus to either further their education or move on with their lives. Joe Wingenfeld, a native of Cleveland, Ohio, is moving back to his homeland. He decided that if he is going to move on with his life, it will be in good old Cleveland. Thank you Joe for all that you have done for us here in Triple V. Your dedication to introducing us to Salsa Dancing Friday Nights and being involved in Social Services will be missed. You are a true hero in our books! David Baker, is moving to St. Louis, MO to further his education. David has been with the group from its humble beginnings. He is our resident artist who designed our logo and coat of arms. I know some of you know him. He finally moves out of town this Wednesday, Feast of the Assumption of the BVM. His email address in the email distribution list is not active anymore and I will reach out to him via his mobile phone number on how to get in touch with him. Good bye, O Great Artist! Your drawings and sketches shall be missed! 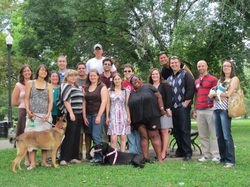 On a beautiful August Sunday, the group had an outdoor barbeque at German Villages' Schiller Park. The weather was at a perfect 78 degrees. We prepared the tables underneath a tree and place all the foods and drink on the tales. There was a softball game to our east, a baby shower party to our north, and the whole west area was for us to use. Members brought their four legged loved ones as well, so they are Honorary Members - Oliver, Max and Mollie (they are in the photos too!). There were 17 people in attendance at the picnic. We had burgers, hotdogs, pies, corn bread, cupcakes, salads and lots of drinks. JP bought a portable charcoal grill just for the occasion and it went really well. Roque was on cue to be the official BBQ griller. Thank you Roque! Hats off to Crystal for organizing this successful event! Everybody had tons of fun! Thank you all for bringing your side dishes, desserts, drinks to share! Thank you for bringing your pets too! Everybody enjoyed the company of the pets and were entertained by their moments of running around the park. Thank you also for participating in the Photo Scavanger Hunt and for playing Pass the Message as well! We hope you enjoyed those! Please come to our next event in September where we spend a Saturday with the Children of Mary sisters! Sr. Julie Anne Sheahan, OSF is inviting young adult, single, Catholic women to join in their Year of Faith Vocation Discernment Retreat on September 21-23, 2012 and November 9-11, 2012. 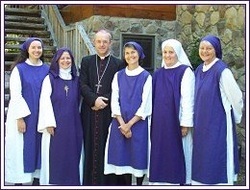 Check out their website or call Sister Mary Ann Spanjers at 920-973-9903! It is official, we are booked to have a tour of 3 Catholic Church sites in the Metro Cincinnati area. As the Year of Faith officially kicks off on October 11, 2012, we shall start off by visiting Ohio River area Catholic sites - The Athenaeum/Mount St. Mary of the West Seminary Cincinnati; St. Monica - St. George Newman Center Cincinnati, OH; and St. Peter in Chain's Cathedral Cincinnati. Now you must be wondering why these three places? Mount St. Mary of the West Seminary is the third oldest seminary in the United States, the first West of the Appalachians. This is where Bishop Purcell envisioned priests would be learning how to live their lives to serve Jesus and his chosen people. This beautiful seminary is worth visiting and it is located east of Cincinnati. St. Monica - St. George Parish was the Cathedral of the Archdiocese of Cincinnati from 1938 to 1957. The interior is richly programmatic, and remarkably elaborate for a parish church. The painted symbols include the Mysteries of the Life of Christ, the Imitation of Christ, the Holy Sacraments, and the Means of Grace. In the apse is the Eternal Life in Paradise. The large windows depict the Twelve Apostles, St. Monica and St. Augustine. The windows around the altar refer to the pre-figuration of the Crucifixion, and to the Eucharist. The smaller windows portray scenes from the New Testament and the life of St. Monica. The North chapel is dedicated to the Virgin Mary, and the South chapel to St. Joseph. St. Peter in Chains Cathedral is a unique Catholic Cathedral that is in the style of a Greek theme. Greek mosaics, Corinthian columns, and massive bronze doors. As the Archdiocese of Cincinnati is the Metropolitan See of the Dioceses in the State of Ohio, we, from the Diocese of Columbus visit our humble roots and origins as we were once under this great Archdiocese. Our Saturday pilgrimage starts at 10:30 AM with a tour, then a 1 PM tour, then a 2:45 PM tour. It will conclude with a 4:30 PM Mass at the Cathedral. We have alerted the Young Adult Group there of our arrival in case they would like to join us or meet up with us after mass and have dinner around the downtown area. We are not obliged to give any monies to the places of worship that we are visiting but a free will offering is appreciated. Please let me know by calling JP at 614-962-0808 if you are coming. Currently (10/17/12), we have 7 people going. In the pilgrimage our goal is to grow our faith closer to Christ as we visit marvelous structures that give glory to God and increase our desire to love God more and more. We are going to spend a Saturday morning till afternoon helping out the Sisters of the Children of Mary work at their woods area. We will start off with a 9 AM mass at their chapel and then end up with the Recitation of the Chaplet of Divine Mercy. On April 30, at St. Matthias Church, there was a dinner benefit for the Lighthouse Foundation, a sponsor for Bryan's Seminary studies. The foundation is meant to help people answer God's vocation for them in His ministry but do not have the means to do it or finances to support themselves. Bro. Bryan (fourth from the left, in a beard and in a grey habit) said in his privileged speech that "we are all called to profess our faith and we are all those images of the Catholic Church." We are all called to do God's will which is to reflect on His Word and to be witnesses to His Word through our daily activities and actions. Bro. Bryan also mentioned that God's love is in each of us and that we are to manifest it at all times, through our families, friends, neighbors, strangers and even to our enemies. Bro. Bryan even painted a picture of a world where there are many nuns, religious and priests, then there would be less chaos, less evil, less arguments, less abortions, less corruption, more time for prayer, time for rest, time for understanding, time for praise and worship to Our Lord Jesus Christ. Wouldn't that be a really perfect image? Wouldn't life be so beautiful? But we know that it is up to us to embrace our crosses and not to run away from them. It is up to us to carry our crosses with Jesus' help and not to suffer on our own. We are always reminded that we are all called to a prayerful life. Our prayers can do miracles! Our personal sacrifices can heal the sick, save souls in Purgatory, convert sinners, produce more saintly role models, advance God's agenda of unity and peace throughout mankind. So come join us every First Friday as we pray for vocations! Let us pray for some of our other members who are also hoping to respond to God's call for vocations. Let us not forget those who are in our group that we have not seen for a while that God will lead them back to our group. The Feast of Our Lady of Mount Carmel was celebrated with simplicity yet festivous at Worthington, St. Michael the Archangel Parish on Monday, July 16, 2012 at 6:30 PM. Every Feast day of Our Lady of Mount Carmel, Third Order Carmelites either profess their undying devotion to the Order of Carmel or are welcomed to the Order of Carmel. This year is special for one person in our Triple V Group. Our very own Mary Hodgson has contemplated for a very long time and has undergone rigorous initiation into the Life of Prayer according to the Carmelite Order. She finally was admitted into the order as a novice of the Third Order of Carmelite. She officially received her brown scapular ( you cannot miss it in the photo). In case you do not know, the Feast of Our Lady of Mount Carmel started in the late 1200s to early 1300s in present day Israel. The Carmelites were Christian hermits living on Mount Carmel in the Holy Land. They built a chapel on the mount and named it after the lady whom they, the Christian hermits, conceived as the lady of the chapel. Some famous Carmelite saints are follows: St. Terese of Avila, St. John of the Cross, St. Therese of Lisieux, and St. Teresa Benedicta of the Cross. Please continue to pray for Mary that God through the intercession of the Blessed Virgin Mary guide her through her vocation and prayer life. Just a reminder to everybody that Wednesday, August 15 is a Holy Day of Obligation. 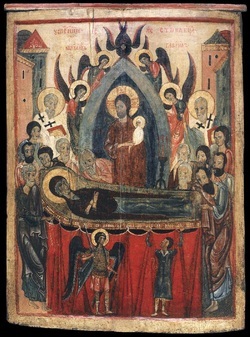 On this day we remember our Blessed Virgin Mary's dormition and where she was assumed to heaven body and soul. God would not allow the same body that bore the Messiah to lie corrupt on earth. we too are great. Our life is not oppressed but raised and expanded: it is precisely then that it becomes great in the splendour of God. "mother" to whom we can turn at every moment. On this feast day, let us thank the Lord for the gift of the Mother, and let us pray to Mary to help us find the right path every day. Ladies and gentlemen! Good day to you! On Sunday, August 19, if you have not gone to mass yet on this day, you can all come to the 12:30 pm mass at the Cathedral. After the mass, we will head out to Schiller Park for a picnic. Bring some food to share (we shall be assigning items to people soon), bring friends, bring some outdoor games that we can all participate and play. This will be a great time to bond and get together after a long time. I know, it has been a long time! Definitely need to catch up and see each other again! First Friday Attendance from the Group is increasing! 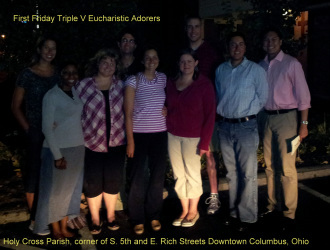 On Friday, March 2, 2012, 5 group members of the Triple V Group attended the 7:30 PM Mass at Holy Cross, received the Sacrament of Reconciliation and stayed for 4 solid hours in vigil during the All Night Vigil. It was an awesome experience and everybody at church was thrilled to see young people doing Eucharistic Adoration on a Friday night! JP was asked to lead some of the prayers during the vigil as well. In attendance in March was Kurai, Crystal, Jennifer and Roque. We hope that we can add more people to the group. 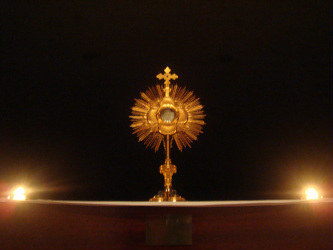 You don't have to stay all night but do consider giving a part of your busy schedule to be there in adoration! This is the longest Eucharistic Adoration that has been going on in the Diocese of Columbus. NOTE: We are attending the 7pm Mass at St. Joseph Cathedral instead and witness the Transitional Deacon Ordination of 2 Seminarians as they prepare for the Priesthood next year. After the mass, we shall proceed to Holy Cross to continue on for Eucharistic Adoration for Vocations. 7:30 PM First Friday Mass (Sacred Heart of Jesus) and All Night Eucharistic Adoration (8 PM - 12 MN) at Holy Cross Parish at 204 S. 5th St. Columbus, 43215. (Confessions are heard right after the procession of the Blessed Sacrament around the church.) During these First Friday Masses, we normally pray for Vocations, especially those discerning in our group and for the entire Catholic Church. We also pray for all of our group members, especially those in need of prayers. I personally hope that we can have two - three groups to participate in this spring time Service Saturday event sponsored by the Catholic Social Services. I pray that you will make time for this event. It starts at around 8:30 am and ends at when the task(s) is/are satisfactorily completed. Service Saturday - Save the Date! The upcoming Service Saturday event will be on Saturday, May 19! Remember our goal this year is to have two teams of 3-4 each! If we exceed that, that would be wonderful! Synagogue Trip a Success, thank you Rabbi Melissa Cresspy! 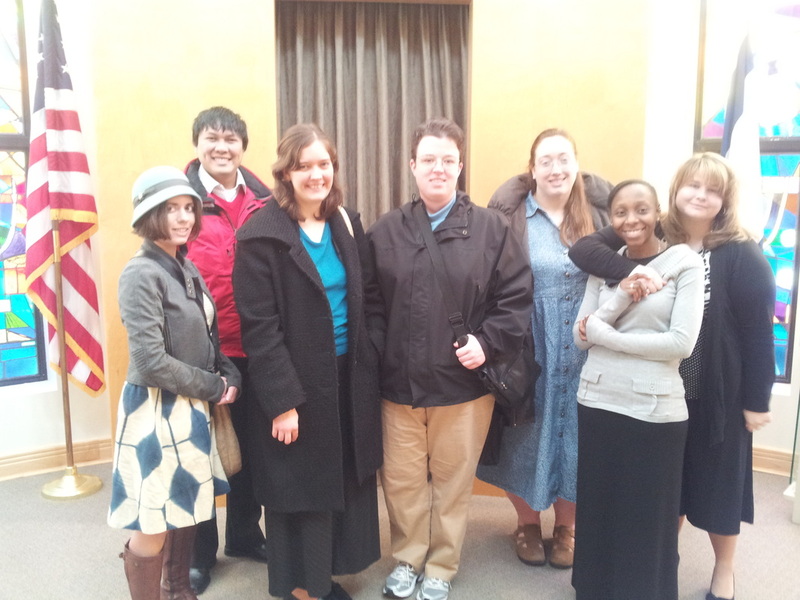 The group that went to the synagogue tour. We were posing by the Ark inside the chapel. The trip to the Congregation Agudas Achim today went really well! The sun was out, the air was crisp but not chilly and the roads were dry. Now, that's the best February winter weather one could ever ask. The tour started at the Atrium of the social hall area/classroom area of the synagogue. Rabbi Melissa arrived and introduced herself to us immediately and went ahead to remember our names. 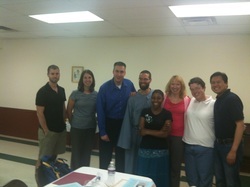 The people in the picture are as follows: Stephanie (from St. Peter), JP, Mary Clare, Mary, Michelle, Kurai and Jennifer. Rabbi Cresspy was the one who was taking our photo. Rabbi Melissa started the tour by showing us the nice colorful windows that were facing E. Broad Street. 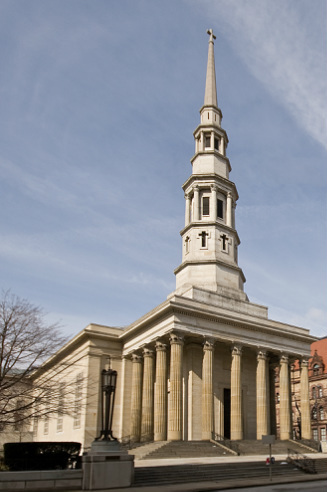 Opposite the stained glass windows was the hall of Benefactors and Contributors to the present synagogue. She then brought us in the sanctuary area. The sanctuary area was fairly huge. It looked like a congregation of about 300 people can fit in comfortably. Like Catholic Churches, the synagogue has an elevated area where a central table and two pulpits are located. Behind it was the Ark or Tabernacle (acronym of Aron Kadesh [pronounced as AH-rohn Ka-desh] the place where the Torah is kept). Above the Ark is a light that is continually lit signifying the presence of God inside the Tabernacle through the scrolls. The Ark is always located at the area of the synagogue facing Jerusalem (in the case of the synagogue, we were facing east). Rabbi Melissa was kind enough to show us the contents of the Ark. Inside it were several scrolls each covered specifically for different occasions and seasons of the Jewish calendar. The Rabbi also showed us the "Yads" (a Torah pointer, used by the person reading from the Torah or the scrolls), the Torah (scrolls of the first 5 books of the Old Testament), and the Torah cover (the special cover used to house the scrolls or the Torah). When the Torah is brought out, people respect it by not walking around or waiting for God's word to be done and when the blessing after reading from Torah is said. During Shabbat, the service is about 3 hours long. The first part are preparatory prayers which consists of the chanting of the Psalms. Then the Torah is brought out and is read to the congregation. Then the Rabbi provides a brief homily or the "derasha". After that, prayers are said from the Siddur (book of Jewish prayers recited during services). After the prayers, the Torah is returned to the Ark and a few more prayers from the Siddur are said plus prayers for the sick and those that have passed away in the congregation. Then the Rabbi and congregation says the final prayers and the service is over. Some congregations would have a community kiddush, which is a festive meal during Shabbat (this is the second, the first one occurs on Friday night, when Shabbat officially starts [which is at sunset Fridays]). After the wonderful tour of inside the sanctuary area, we ended up at the chapel. The chapel was pretty well lit as evidenced in the photo above. It is the same structure as the sanctuary area except the central table where the Torah is read, is not elevated and there are no pulpit structures. 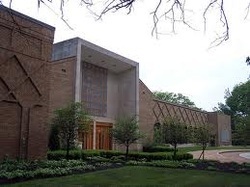 Weekday services are held on Mondays and Thursdays at the Congregation Agudas Achim. The chapel has twelve tall and narrow stained glass windows which represents the twelve tribes of Judah [Reuben, Simeon, Levi, Naphthali, Isachar, Asher, Dan, Zebulun, Gad, Benjamin, Judah and Joseph or Mannaseh - the twelve sons of Jacob, our forefather in faith]. Inside the chapel, Rabbi Melissa answered a few of our questions such as what are the Jewish Holy Days and do they read the other books of the Old Testament as well. We are very happy and privileged that Rabbi Melissa had the time to give us a tour of the synagogue with her busy schedule. She extended the invitation to all to join them in Shabbat Services on Saturday mornings that starts at around 9 (but people generally arrive at around 10-10:30am when the Torah is brought out). A Night on Forgiveness and Reconciliation"
Our friend Bryan O'Donnell will be in town and we are planning to meet up with him for dinner to show him our love and support for all the prayers we have done for him. The date and time will be posted as soon as it has been confirmed. I would like to welcome the following to the Triple V family - Tina Renn and Rachel Selzer! Please help me welcome them at any of our upcoming events that you would see them. Also, I'd like to welcome Roque Gomez for actively participating with our charitable works activities! He's a member of the Gahanna St. Matthew parish and from CREDO! Make them feel welcomed and at home with the group. Bryden House event, a big success! 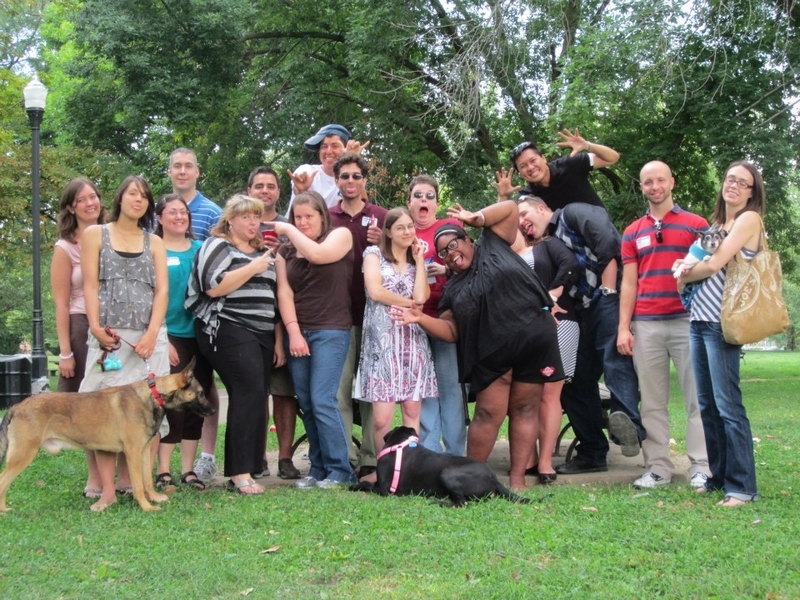 Thank you very much to all those who participated in last Saturdays Bryden House event! 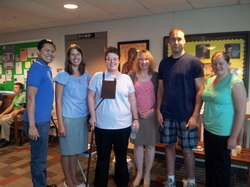 We had a total of 7 helpers plus the St. Vincent de Paul Society Cathedral Group feeding the residents of Bryden House. Bryden House is a housing for low income generating individuals. Normally, we do feed about 50-80 people. Last Saturday, February 11, we fed about 50 people. The meal that was prepared were a pasta dish, salad and bologna sandwiches! They had a choice of flavor for their fruit punches to drink! Our helpers at the event were Roque Gomez (from CREDO), Tina Renn (new member), Rachel Stelzer (new member), Crystal, Kayla and yours truly. Of course, Andrea S was there but she's a member of the SVdPS already. I am sure that the residents were truly happy that they all had a chance to have seconds, thirds and even fourths! Deep in their hearts, they had a great meal for the day! Saturday, February 11, 2012 - 10:30 AM to 12:30 PM Bryden House - come and offer some assistance with the Cathedral's St. Vincent de Paul Society and spread the joy and love of Christ by offering your time and smiles to our less fortunate brothers and sisters by serving them a lunch meal. Bryden House is located at 1555 Bryden Road 43205. SPEAKER: Nick Cardilino speaking on the topic of..."Bringing Back the Corporal Works of Mercy"
Everybody is invited to attend the Mass at St. Matthew's in Gahanna. After Mass will be Vespers and then off we go bowling at Gahanna Bowling Lanes. Gahanna Bowling Lanes is located at 215 West Johnstown Road Gahanna, OH 43230 (614) 471-1111 - http://www.gahannabowling.com/ A game is $4.75 and $3.00 for renting the bowling shoes. We've invited Gahanna's CREDO group (their Young Adult Group) and other Young Adult Groups in the area to play with us a friendly match. Triple V will visit a synagogue on Sunday, February 19! We will tour the interior of the synagogue and prayer area. We will also learn the services done at a synagogue. Rabbi Mitch Levine will give us a tour of the synagogue. Please dress up appropriately. No t-shirts or torn clothing attire. Preferably, a long sleeve shirt with a jacket/shirt and tie for men, Sunday dress for women or dress pants. After the tour, those who are interested may join the rest who would like to have brunch after. The place for brunch will be determined as the day of the event approaches. You are free to attend mass wherever and at a time convenient for you. We found out that the nearby parishes to the synagogue are either too early or pushing close to the tour time. St. Catherine of Sienna - S. Gould St.
Christ the King - E. Livingston Ave.
Holy Spirit - E. Broad/Yearling Rd.